The 2013 NFL Combine started last weekend. We will give recaps of the top players at every position. Today we discuss tight ends. The tight end position is evolving in today’s NFL. With the emergence of players like Rob Gronkowski, Aaron Hernandez and Jimmie Graham, the tight end of today is a versatile player that can line up anywhere and create mismatches. They are too big for corners to cover and too fast for a safety. NFL teams are looking for big, fast guys that can drive defenses crazy trying to match up with them. The best in this class have been called “The Killer E’s”, Tyler Eifert, Zach Ertz and Gavin Escobar. Justice Cunningham-South Carolina (6-3 258 lbs. ): Doesn’t have blazing speed (4.94 40). Used savvy route running skills to average over 13 yards per catch for most of his career. Better blocker than receiver. Strong lower body (9’8” broad jump). Will make a team due to his blocking skills and will steal a few catches here and there. 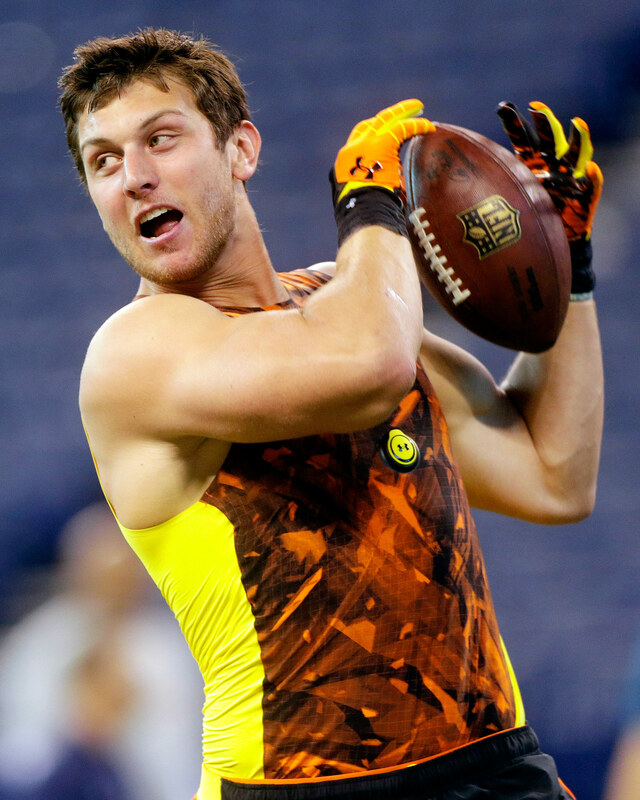 Tyler Eifert-Notre Dame (6-5 250 lbs. ): May be the top tight end in the class. Good combination of size and speed. Had a good day of work outs. Smooth route runner. Natural pass catcher. Strong hands and will fight the defender for the ball in the air. Numbers decreased as a junior, but that was due to defenses keying on him. Makes the most of his catches, most of them resulting in first downs or touchdowns. Improved as a blocker. Able to line up wide or in the slot. 4.68 40 yard dash. 35.5” vertical jump. Best 3 cone drill of the day (6.92). 9’11” broad jump. 4.32 short shuttle. Zach Ertz-Stanford (6-5 249 lbs. ): Playmaker of the Stanford offense. Will be competing with Eifert to be the first tight end taken. Runs nice routes. Very smooth. Able to line up anywhere. Speed to stretch defenses. 4.76 40 yard dash. 24 bench press reps (#2 among TE). 7.08 3 cone drill. His measurables are slightly lower than Eifert, but I like him better. Ertz was the guy that Stanford looked to when they needed a big play and he delivered some game breaking plays this year. Gavin Escobar-San Diego State (6-6 254 lbs. ): Strong hands. Does a good job extending his arms and snatching the ball from the air. Does a good job tracking and locating the ball. Doesn’t get great separation, but knows how to box out against defender since he was a high school basketball player. Disappointing 40 yard dash (4.84). 32” vertical jump. Likely the third tight end taken in the draft. Chris Gragg-Arkansas (6-3 244 lbs. ): A bit undersized, but extremely athletic. Former wide receiver. Adjusts well to bad throws. Not a dominating blocker, but gives good effort. Can be careless with the ball. Ran the fastest 40 (4.50) and has the best vertical jump (37.5”) of any of the tight ends. Will have to be more of an H-Back due to his size. Durability is a question mark for him. Philip Lutzenkirchen-Auburn (6-3 258 lbs. ): The guy with the funny name made famous by his 7 touchdowns in Auburn’s championship season. Played only three years at Auburn but has the school record for touchdowns by a tight end (14). Is a matchup nightmare in the red zone. Uses his size to shield off defenders. Strong hands to make catches in a crowd. Plays well as a move guy. Solid blocker and pass protector. Does not possess great speed (4.94). Injuries have been an issue. Vance McDonald-Rice (6-4 267 lbs. ): Latest to come out of what is becoming Tight End U. Son of former Longhorns linebacker Bret McDonald. Looks natural in space with the ball. Has a few drops and needs to work on that aspect of his game. Versatile player that was used as a slot receiver and can also long snap. Owls even used him fly sweeps. Gets good yards after the catch. Has no experience as an inline tight end, and would be more comfortable as an H-Back. Very willing blocker, but mostly on defenders in space. 4.69 40 yard dash. 33.5” vertical jump. 31 bench press reps (best among TE). Jordan Reed-Florida (6-2 236 lbs. ): Has played all over for Florida. As a redshirt freshman he split time as the starting quarterback with Trey Burton. He also played wide receiver before settling down as a tight end. Led Florida in receptions his junior year before declaring for the draft. Used from a variety of spots along the formation: inline tight end, detached tight end, receiver, H-back, and even some running back. Very smooth in and out of breaks. Has good moves in the open field. Makes people miss. Willing blocker, but needs to work on his technique. 4.72 40 yard dash. Has drawn some comparisons to former Gator TE Aaron Hernandez. Mychal Rivera-Tennessee (6-3 242 lbs. ): Two year starter for Tennessee after transferring from Oregon. Shows decent athleticism and strong hands. Locates the ball well and has the ability to run under it and make the catch. Extends his arms well and catches the ball away from his body. Willing blocker that can also line up in the backfield. Not extremely fast (4.81) and may have issues getting separation at the next level. Dion Sims-Michigan State (6-5 262 lbs. ): Big tight end that was like having a third tackle on the field. Played at 282, but lost 20 lbs. for the Combine. Has a massive frame which makes him an easy target for the quarterback. Good blocker, but not dominating. Has soft hands and uses his big body to shield off defenders. Has tight hips and does not move as well as you would like. Ran a faster 40 time than expected (4.75) but not overly athletic. 35” vertical jump. Jake Stoneburner-Ohio State (6-3 252 lbs. ): Did not get many receiving opportunities due to the offense. Played some wide receiver as a senior. Seems to disappear at times, but that could be related to the offensive scheme. Has long arms and a wide catching radius. Average blocking ability, which may be why he was moved to receiver. Had some law related issues at Ohio State and was suspended from the team for a while. Good speed (4.65) and leaping ability (35” vertical). Bench pressed 22 reps. Had the second best short shuttle of the TE group (4.27). Michael Williams-Alabama (6-6 269 lbs. ): Big and massive. Was like having a third tackle on the field for the Crimson Tide run game. Matchup nightmare in the red zone. Surprisingly athletic for his size. Ran a 4.52 40 (2nd fastest TE). Tied for the best vertical jump (37.5”) and had the best broad jump (10’ 6”) which indicates lower body explosion. Uses his big body and jumping ability to make plays above defenders. Doesn’t bend well or have great feet, so he’s probably an inline tight end. I’d need to examine with you here. Which is not something I usually do! I get pleasure from reading a put up that can make folks think. Additionally, thanks for permitting me to remark! This entry was posted on February 27, 2013 by draftmaniacs in All-Star Games and Combine, Scouting reports and tagged 2013 NFL Combine, 2013 NFL Draft, Gavin Escobar, NFL Draft, Notre Dame football, Stanford football, Tyler Eifert, Zach Ertz.